The Eldorado Brougham for 1960 reflects, in every facet of its classic beauty, an inspiring elegance flawlessly fashioned into metal and glass through artistry of Fleetwood custom-coachcrafting. Every detail of the Eldorado Brougham is, in fact, attended with but one objective ... to provide, for its limited circle of ownership, a motor car of the finest custom-quality with luxury, comfort and convenience second to none. 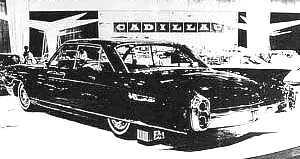 The unique design and exclusive character ... the inherent dignity and classic distinction of the Eldorado Brougham make it, more than any other motor car, the logical complement to the stature of those for whom it was especially created. The rare photos are from the collection of J.-M. Roux. They represent full-sized styling models. 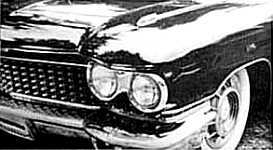 The 1960 Brougham retained many of the proven distinctive features of the 1959 models. A new wider front and rear appearance was achieved with the new grille, new front bumper, new parking and driving lights and the oval housings in the rear bumper, each containing two circular lamps with concave lenses. Body chrome was limited to narrow edgings which accentuated the body shapes and contours. 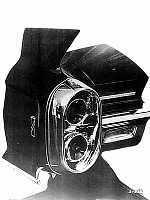 Turn signal indicators were now located on top of the front fenders, incorporated in the new crown moldings [bulbs had to be changed from the underside of the fenders]. Again the small quarter-window recedes when the corresponding rear door is opened. 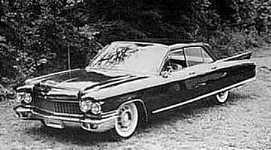 The most distinguishing feature of the 1960 Brougham [which became a feature of standard Cadillac models in 1961 and 1962] is the new, so-called flare molding, a second fin or skeg running from just behind the front wheel openings and extending gradually outward and downward, at an angle of about 45 degrees, level with the center of the wheel hubs, with a chrome edging. This was a very stylish complement to the upper, restrained tail-fin. Distinguishing marks of the last of the elegant Brougham models include an oblong plaque with a red cloisonné inner area marked "Brougham", diagonally upwards from left to right [image, right]. These were moved, in 1960, from the front to the rear fenders. 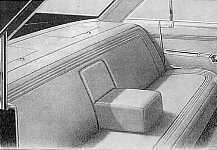 Once again, two interior options were offered: full leather, this time with narrow, vertical piping [photo below, left], or plain soft fabric trim with narrow, triple piping on the upper seat back, cushion front and upper door panels [image below, right]. The Florentine-grained leathers and broadcloths came in the same hues as in 1959. Mouton carpeting was offered again, but gone was the Afghani Karakul wool imitation (actually a tight nylon loop); it was replaced with much more prosaic nylon blend loop carpeting. 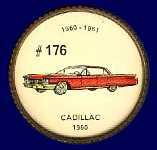 The instrument panel was very much the same as that used on the stock 1960 Cadillac models. 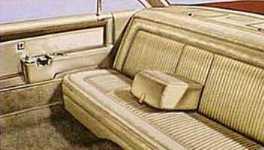 Interior appointments remained basically unchanged from 1959 and included the same rear shelf storage compartments. 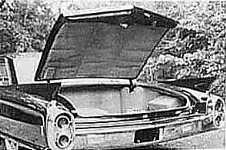 The master switch for the rear quarter-window was omitted this year. 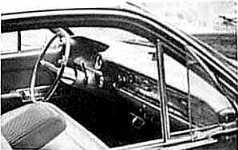 In 1960, these vent windows are operated only by the rear door window switches. The majority of 1960 Broughams went to east coast dealerships (60 cars) and California (41 cars); six of them were exported, including one that went to the Emirate of Qatar. 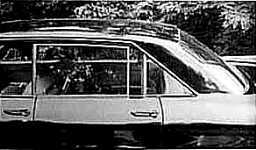 That car is known to have survived; it is currently (2005) in a private collection in France.